This is what I have already started (Saturday 5/1/2013), have since added theatre markings and OD where appropriate. Image of decal sheet as well, plan to do at least 4 of these!! Hi Darren, thanks for joining in mate. 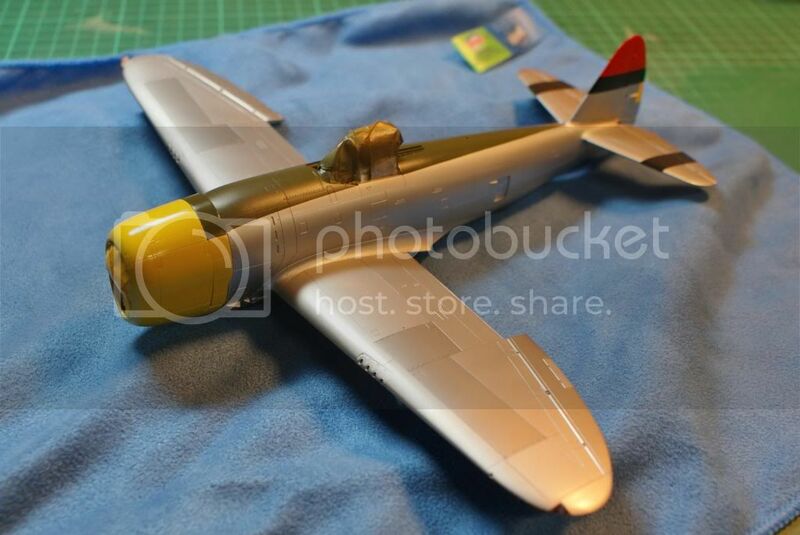 You are a P-47 building MACHINE fella, you must get bulk discounts buying container loads of kits direct from Tamiya ?? The production line technique works well for me, usually have many subcomponents assembled & painted already (engines, props, seats etc). What is the connection between the Otaki and Arii kits? I'm building the Otaki razorback and other than the company name differences on the box everything appears to be the same right down to the color of the plastic and decals. Hi Mark, welcome aboard mate ! I'm sure a bloke with your capabilities can manage one in the 8months allowed. As for me and Lampie, well, we will just wait and see. BTW, I got your PM on the "other" forum about the cars, will arrange that very soon. As for me and Lampie, well, we will just wait and see. "Hanger Queens" you say?,,thank ***k for that! OK, here's my official entry. 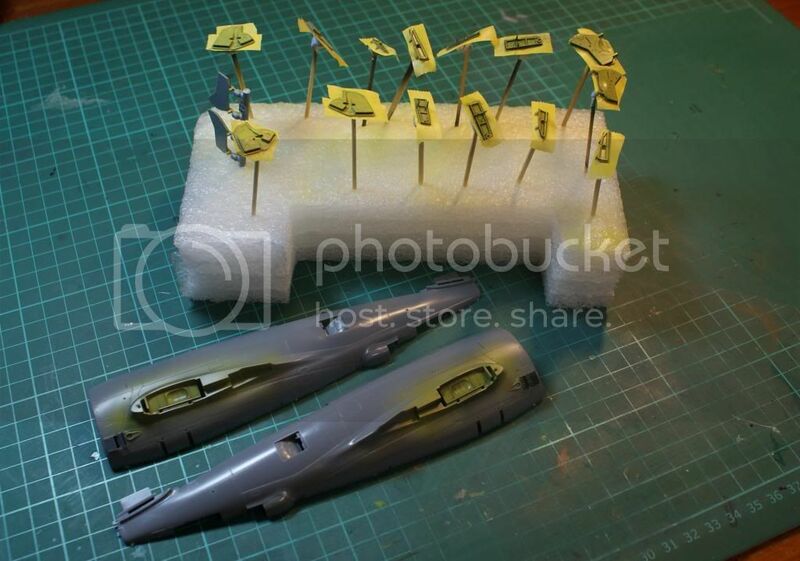 1:32 Hasegawa Bubbletop, started way back in March 2011, so heading rapidly towards its 2 year anniversary! Painting masks are on order from Miracle Masks and I'll be picking them up in a couple of weeks at one of the first shows of the year.FAA Museum Yeovilton, which I've wanted to visit for a long time. 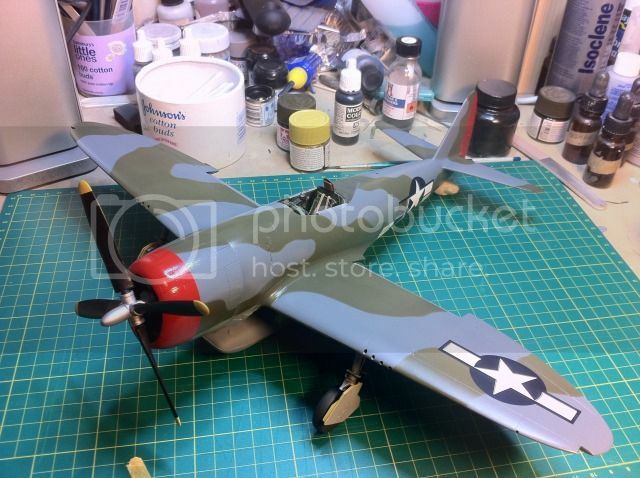 I reckon I know someone else who has a 1:32 Hanger Queen version of the same P-47? It will be great to see your kit carry on to completion mate, and I'm sure that including the hangar queens will see a couple more dragged out of mothballs. Up to 15 enlisted, a couple of weeks to get prepared. Hmmm.. February to September.. Might be tight but I should be able to get one done I think. Now which one to build. 5. Tomcat31 (Allen) - trying to confirm the origin of Camo's kit, or possibly planning to steal it ! Up to 19 enlisted, a couple of weeks to go. Please feel free to post up your proposed builds here. Ok i've decided that Sam's kit and decals do belong to her... 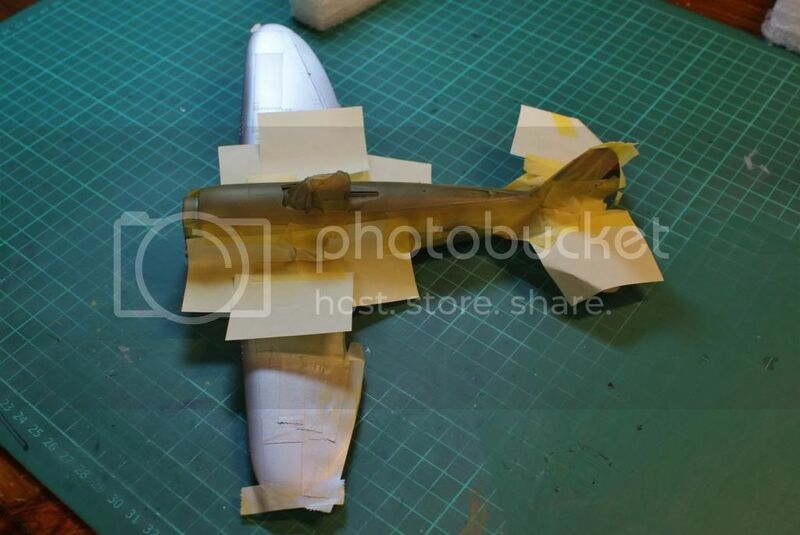 So as Hangar queens are allowed I'll be attempting to finish my Hasegawa 1:32 P-47 that I started a long while back and then got boxed up for when we moved house. Here's the Build log that I started for it. I'm not convinced, but I will have to defer to your decision Allen. We will let Sam claim the kit as hers for the benefit of the Group Build, and in the interest of domestic harmony. 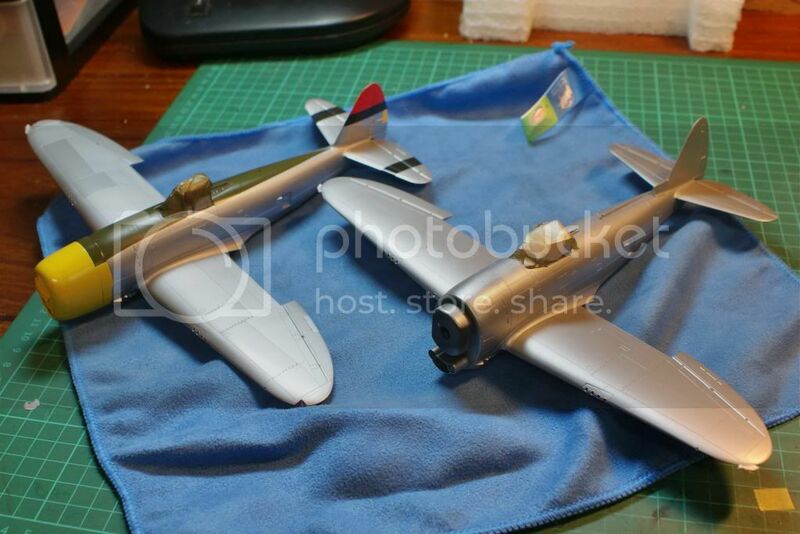 It will be great to see the big Hase kit finished up, very nice choice. Which of the four Trumpeter 1/32 kits should I build? I know they are all terrible kits (sarcasm) and I will not enjoy building any of them, but they are what is in the stash and must be built no matter how much it pains me.. So over to you people to help me decide. Gee your up early mate! The joys of working in construction, had a 7am meeting but the client is running late, so what else is there to do but browse Kitmaker ? Well I am out of work at the moment and I am up by 4:30 every morning.. Stoopid me! Bump time, just over a week to go now, looking forward to this one getting under way. Progress to date on "Super Rabbit" & "Five by Five"
Super Rabbit ready for decals. Very nice work Darren, please keep posting your progress. Nice progress, Darren. Very nice finish to the paint job. 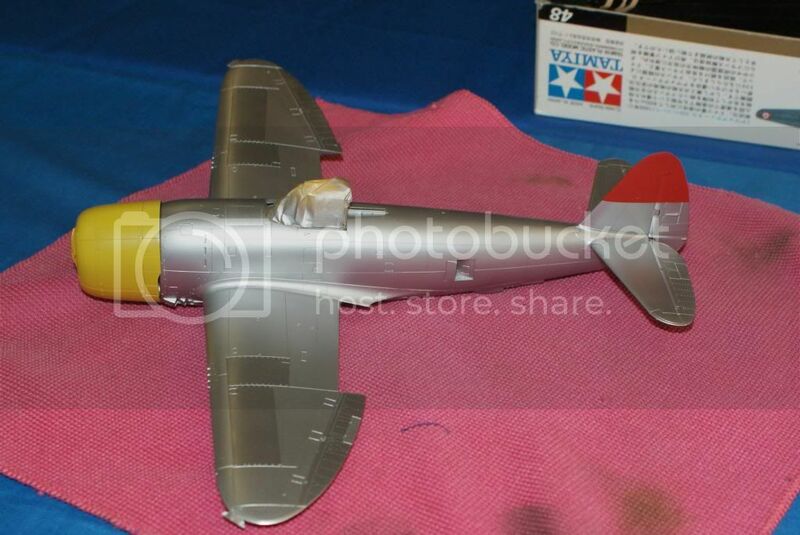 Bump time once again folks, only a few days to go until the styrene madness begins at P-47 Heaven. We are in a holding pattern at 19 enlisted, but I'm sure that we will pick up few strays along the journey. 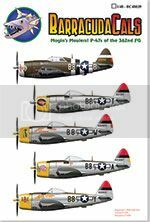 Counting down folks, only 12 hours or so to the start of the biggest, most exciting P-47 Group Build you will EVER see in 2013. 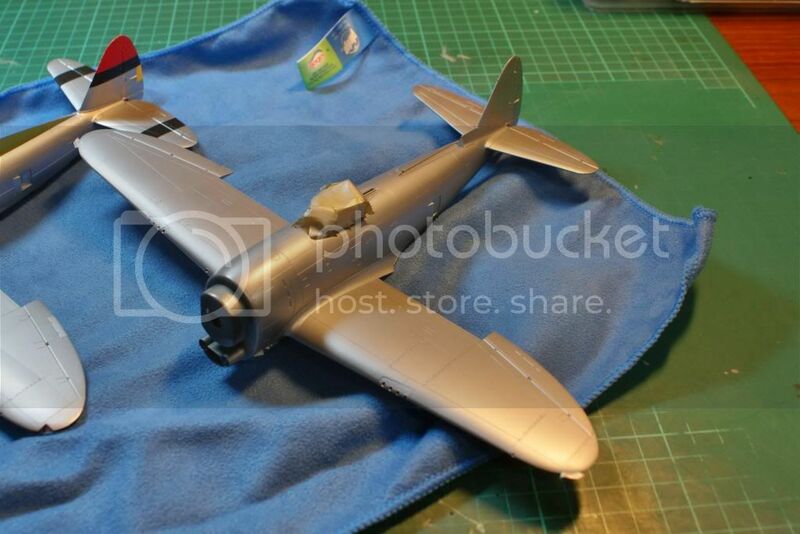 Ok I have decided to build "Balls Out" a P-47D-30-RA from the 405th FG.